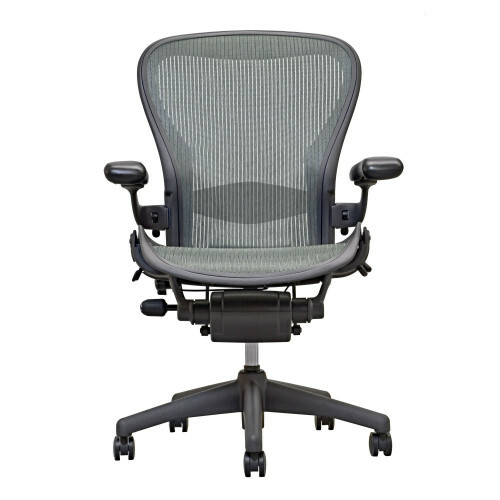 The Herman Miller Aeron Chair Fully Adjustable Size B Graphite comes in the classic and most popular color; the standard size that best fits the widest audiences of customers; and with the features that will your make your seating experience all the more flexible, enjoyable and ergonomically sound: fully adjustable arms, tilt lock and lumbar support. Enjoy the luxury and comfort of the chair that corporate executives, producers and health-care professionals have been selecting for decades, while saving a significant amount of money by buying from Beverly Hills Chairs. I manage a Rolls Royce car dealership, so please excuse the simile, but the Herman Miller Aeron chair is the Rolls Royce of office chairs. There is no other chair out there that even comes close to the Aeron. It's stylish, comfortable, and an all-around high-end piece of furniture. And I got a great deal on my chair from Beverly Hills Chairs. Used or not, these chairs really hold their value. There are 5 people at the dealership who have Herman Miller Aerons and you can't tell that mine is used. I couldn't find an office chair I wanted for the price I could afford. I wanted something that looked luxurious, was extremely comfortable, and of course, affordable. When I shopped at other office supply stores, I found chairs that I could afford, but I always had to compromise luxury, comfort, or both. A colleague told me about Herman Miller Office Chairs. I read rave reviews about these chairs all over the web. I figured they must be the real deal. Then I saw the prices. Herman Miller chairs cost over $1,000! I don't have that kind of money. But after reading the reviews, I knew I needed one of these chairs. Just as I had decided to pull money out of my savings, I found Beverly Hills Chairs. For the amount of money I was about to spend, I could buy two Herman Miller Aeron office chairs. I bought my Herman Miller Aeron from Beverly Hills Chairs. I didn't have to touch my savings and I got the luxury and comfort that I wanted for the right price. I love this Herman Miller Aeron chair. There's no better office chair on the market. And where else can you get a high-end Herman Miller for such a low, low price? A friend referred Beverly Hills Chairs to me. After doing research on the company, I wondered if the chairs were good quality since they're used. After getting in touch with the wonderful people at Beverly Hills Chairs, I was invited down to their physical location. Their customer service representative pulled several office chairs out of the office and they let me try them out. I couldn't tell that they were used at all. They look fantastic, they feel fantastic, and they cost a fraction of the retail price. I'll never buy a Herman Miller chair from any other company.